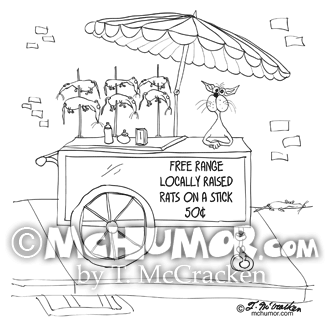 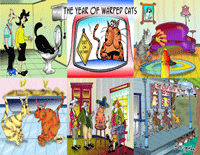 Food Cartoon 9270: At a food cart a cat sells, "Free Range, Locally Raised Rats on a Stick, 50¢." 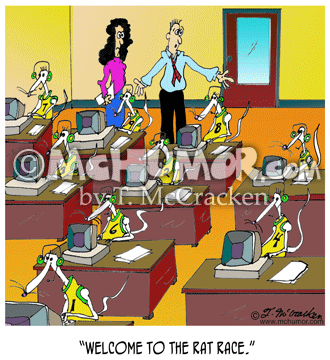 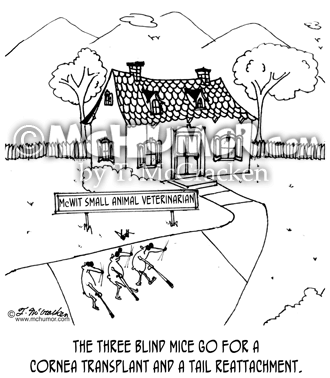 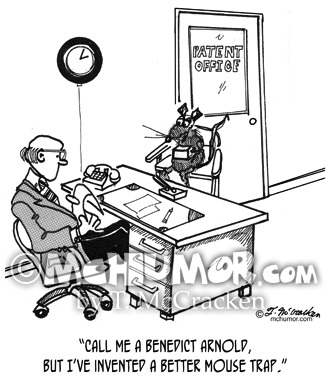 Rat Cartoon 6885: A man showing a woman around an office where all the workers are rats wearing T-shirts with numbers says, "Welcome to the rat race." 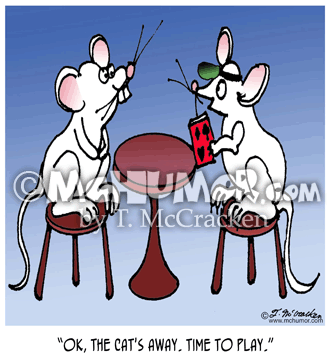 Cat Cartoon 3055: Mouse with playing cards saying to another, "OK, the cat's away. Time to play." 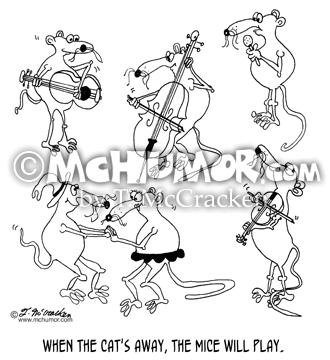 Mouse Cartoon 5091: “When the cat's away, the mice will play.” Mice square dance while others play musical instruments. 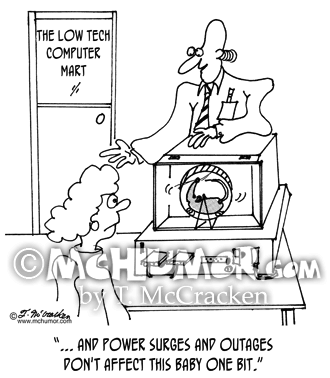 Computer Cartoon 3270: A salesman at "The Low Tech Computer Mart" says of a computer with a hamster in it running in a wheel, "... and power surges and outages don't affect this baby one bit." 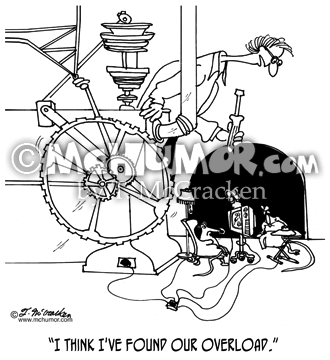 Electricity Cartoon 5537: A maintenance man finding a rat hole with with a lamp, a TV, a fan and an iron plugged in says, "I think I've found our overload." 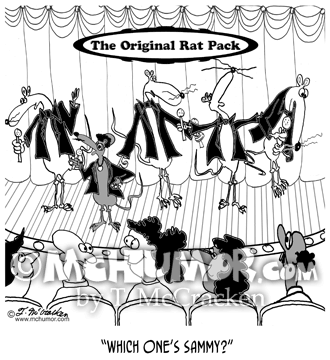 Mouse Cartoon 0215: An engineer says, "Gentlemen, we have invented a better mouse trap." 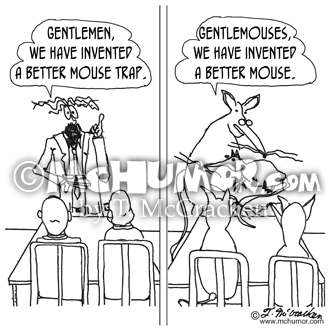 A mouse says, "Gentlemouses, we have invented a better mouse." 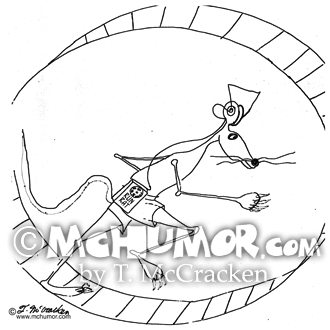 Rat Cartoon 0162: In a cage wheel a rat runs while wearing a Running Rat Radio.